What’s living in your nectar supply? Photo by J.G. in S.F.. This week at Nothing in Biology Makes Sense! For Valentine’s Day, a post on the population genetics of winemaking yeast. And at the Molecular Ecologist: How to start—and end—mentoring relationships, and a call for cool photos and images of molecular ecology and ecologists. Not that it’ll do any good. An excellent, clear summing-up of biologists’ complaints about evolutionary psychology, and an explanation of a more fundamental problem. Not for the faint of heart. A comprehensive report of emergency room visits occasioned by pubic hair grooming accidents. “Active postponing” for the win. Time management tips for the busy biologist. Small things considered. 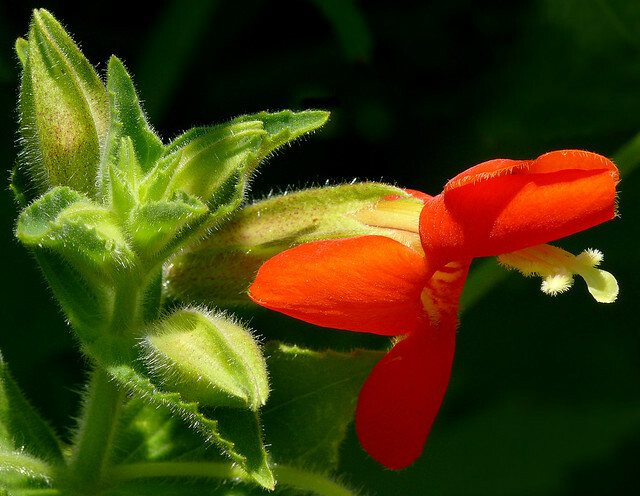 The microbes living in a monkeyflower’s nectar can interfere with pollinator efficacy. Uh-oh. That cushy private-sector job you’re planning on if the tenure track doesn’t work out? Might not work out, either. More than there used to be, but less than it looks like. How many people are applying for NIH funding, anyway? The bayonet vs. the hypodermic. How war gets in the way of public health. Called De Novo, for some reason. Dodgy researcher looking to publish dodgy alleged sasquatch DNA data (apparently) sets up dodgy new journal. Cool. Or, actually, cozy. Proposed energy efficiency changes to New York City housing that could reduce the city’s carbon emmissions 90% by 2050. Called, heh, DEBrief. The U.S. National Science Foundation Division of Environmental Biology (NSF-DEB) has launched a blog.